Cairo has reached an agreement with Hamas to increase the flow of traffic through the Rafiah crossing. Egypt on Wednesday agreed to increase the number of passengers passing through the Rafiah crossing between Gaza and the Sinai to 1,000 per day. Hamas crossing director Maher Abu Sabha told the Bethlehem-based Maan agency that the terminal – the only entry and exit point for travelers from Gaza – currently has 500 registered passengers per day in July. 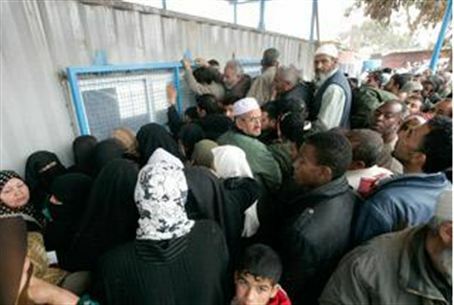 Gazans are required to register in advance with the Gaza Ministry of Interior before travel via Egypt. Cairo's decision to increase traffic through Rafiah comes as Egypt's Muslim Brotherhood president-elect Muhammad Mursi prepares to assume office. Gaza's Hamas rulers, an offshoot of the Brotherhood, have expressed hopes Mursi will help end the party's international isolation. Abu Sabha said he hopes Egypt will also increase the opening hours of the Rafiah terminal, noting that other Egyptian borders are open for more than nine hours daily. Rafiah is opened for eight hours per day. Israel has long opposed the opening of Rafiah citing security concerns. Hamas - which advocates the destruction of Israel via armed confrontation and has an established history of targeting civilians - is listed as a terror organization by Australia, Canada, the European Union, Israel, Japan, the United Kingdom, and the United States. It has also been banned by the Hashemite Kingdom of Jordan.